A bar graph gives you an easy way to compare numbers or values. For example, the following figure shows a bar graph comparing the performance of five trainers at a fitness center. The number of new clients recorded this quarter. As you can see from the caption, the graph shows how many new clients each trainer has enrolled this quarter. 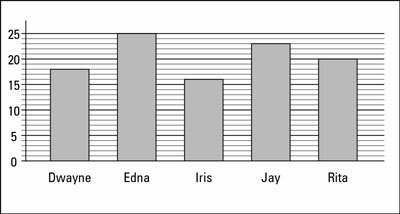 The advantage of such a graph is that you can see at a glance, for example, that Edna has the most new clients and Iris has the fewest. The bar graph is a good way to represent numbers that are independent of each other. For example, if Iris gets another new client, it doesn’t necessarily affect any other trainer’s performance. Individual values: How many new clients does Jay have? Find the bar representing Jay’s clients and notice that he has 23 new clients. Differences in value: How many more clients does Rita have compared with Dwayne? Notice that Rita has 20 new clients and Dwayne has 18, so she has 2 more than he does. Totals: Together, how many clients do the three women have? Notice that the three women — Edna, Iris, and Rita — have 25, 16, and 20 new clients, respectively, so they have 61 new clients altogether.